UPDATE: See my video series on Inter-stem grafting apples here! A couple paragraphs for those who aren’t familiar with interstem trees: An interstem (a.k.a. double worked, archaic) tree is one that has an extra stem grafted between the rootstock and the upper portion of the tree. Sometimes the interstem (the stem between the roots and the tree) is there for the sake of compatibility and can be used when the fruit variety is not genetically compatible with the rootstock, but the interstem is compatible with both the top and the rootstock…. think of a kidney transplant, the donor and recipient have to be compatible or the graft will be rejected. Often though, and in my case, the technique is used to dwarf a tree. One problem with dwarf rootstocks is that they are weak. Sure they are small, which is what we want, but so are the roots. Interstem grafting allows us to select a large vigorous rootstock, that would normally grow a large vigorous tree, for the roots and a weak interstem to dwarf the tree… small tree big roots. That means, no staking of the tree, which would be required for a weak dwarfing stock. They also need less water. Interstem dwarfs on the left at 8 foot spacing, and oblique (diagonal) cordon row on the right, tresllised, 18 inch spacing about 7 feet tall. Both will outperform standard trees in production per unit of land. 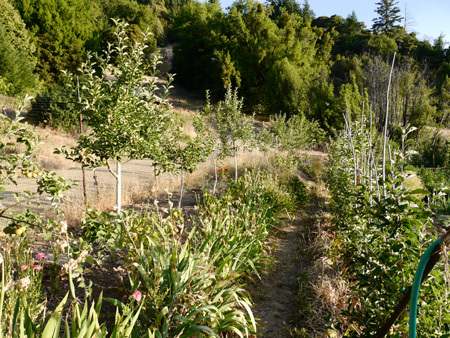 The oblique cordon are on bud 9 however, and require more water than the interstem trees which have a base of possibly the most drought tolerant of the common apple stocks, M111 and interstem of bud 9. The largest looking tree there on the left has a short interstem, and is also growing near a waterline leak.